When you have added a large number of monitors with the custom notification or logging settings, it can be a really tiresome task to modify them one-by-one, if you need to. ProtoMon offers you the bulk edit feature that will make it easier for you to quickly change some properties of the multiple monitors. Select several monitors from the list using the "Ctrl" or "Shift" buttons. Click the right mouse button on the selection and choose the Edit Monitors option from the pop-up menu. 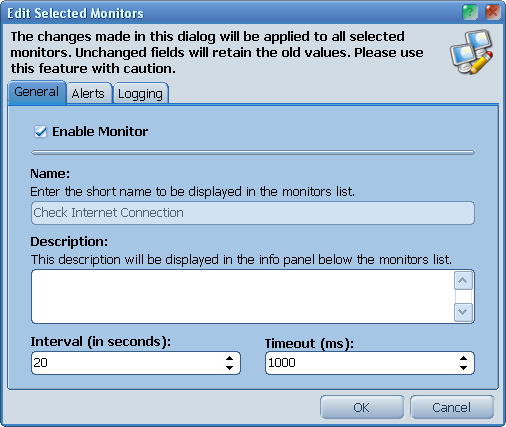 You will see a dialog that is very similar to the standard monitor editor dialog. Its fields will be filled with the properties of the last monitor from your selection. If all of the selected monitors were of the same kind, the dialog will have all tabs to edit all properties of that monitor kind. If these monitors were of the different kinds, you will be able to edit only the properties which is common for all monitor types. Edit the needed fields and click the OK button to save changes to all selected monitors. Please note that only the properties which values were changed in the dialog will be saved. The others will retain their old values. For example, if you have opened the dialog and the initial state of the Enable Monitor checkbox was "checked", and you clicked it two times, so it is still checked, and then clicked the OK button, no change will be made to any of monitors.